Facial scrub mousse and "new skin" mask with Cocoa butter - 50 ml (1.76 fl.oz). Gentle exfoliating action for a soft and cleansed skin (cleans away pore-clogging grime and dead skin cells). Balancing action for a radiant skin (invigorates dull-looking skin). Complexion is purified and clearer. Revitalizes tired and stressed skin. 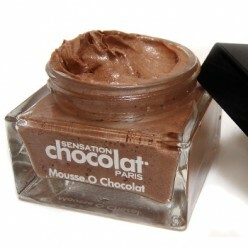 Aerial mousse texture, similar to milk chocolate mousse with chocolate fragrance. Cocoa butter : It is an excellent emollient that actively moisturizes skin by sealing and protecting it. It contains various vitamins, essential fatty acids and antioxidants that further protect the skin, particularly when exposed to sunlight. Relieves irritation and diminishes signs of wrinkling and stretch marks. Aloe Vera : Known for its ability to heal and moisturize the skin. Stimulates human fibroblast cells production, improves fibroblast cell integrity, quickens the making of collagen. Tritisol® : High molecular weight hydrolysates derived from wheat protein. Closest vegetable functional alternatives to soluble collagen. Imparts excellent conditioning and skin-firming to help reduce the appearance of fine lines and wrinkles. Its film-forming and conditioning properties also enhance the performance of our face cream. Apricot kernel micro granules : Natural gentle exfoliant, pulls dirt and toxins from skin. Caffeine : Helps to wake up and firm tired skin by constricting blood vessels. Anasensyl® : Bontanical complex essentially composed of Licorice with anti-inflammatory properties and Horse Chestnut with veno-protective potential. Helps strengthen micro-vascular tonicity. This unique complex works to soothe irritation and conceal redness. It also helps reduce skin sensitivity and soothes daily skin stress (UV, shaving, …).